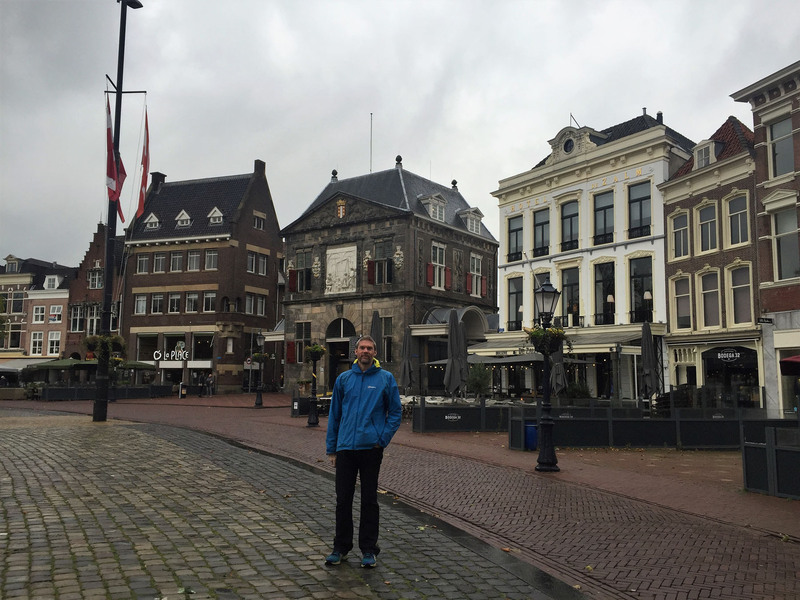 Our final city visit on this tour to beautiful Gouda & a flying visit around the centre of Delft before returning home to reflect on our six month tour. The next morning started brightly, with the unfamiliar sun lighting up the edges of the clouds and highlighting the tawny autumn leaves. 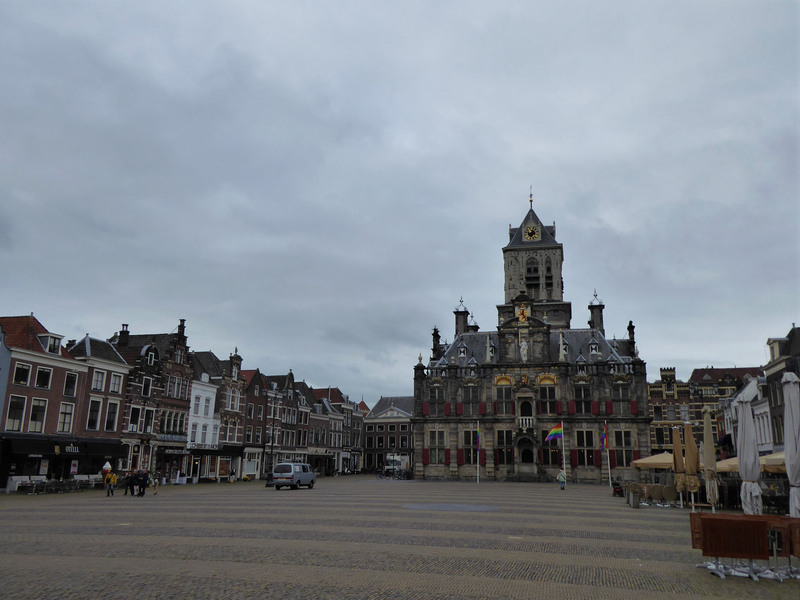 We left the spacious aire in Dalfsen and retraced a few miles back to Zwolle and beyond, heading along fast wide roads past our previously haunt of Utrecht and on into the centre of Gouda. We bagged one of the spots with free electricity in the town’s €8 per night aire at Klein Amerika, checked we could pick up the nearby library’s Wi-Fi from Benny (yes) and then we readied ourselves for a visit into town. 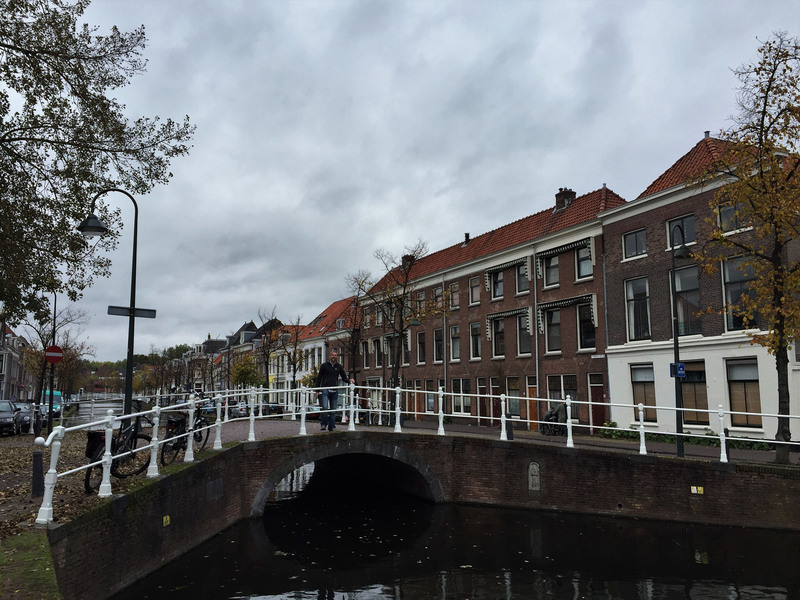 During our drive the rain had sneakily returned, defying all forecasts, so we waited a while until we spotted a break in the deluge and quickly wandered over the bridge across the canal leading into the historic centre. 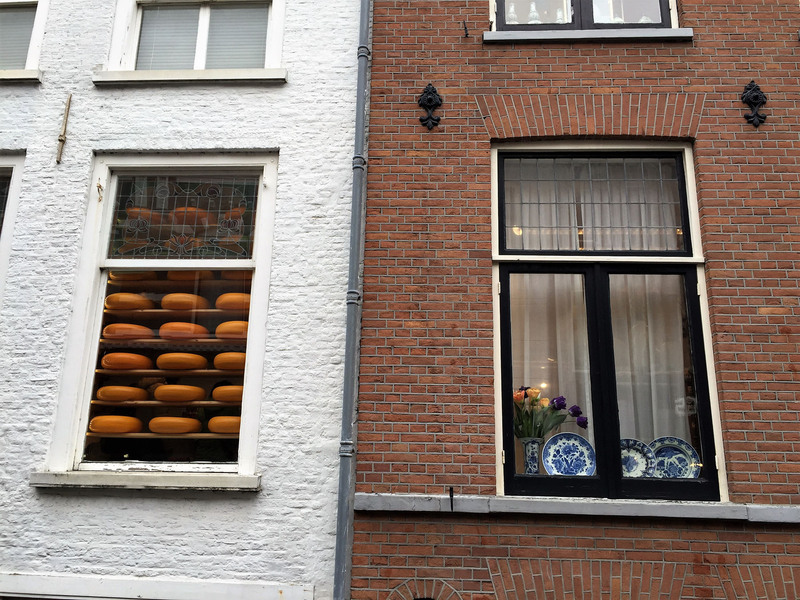 Despite the grey, wet day, we took an instant like to Gouda. There were local flags lining the pretty streets and it had a quiet buzz, a tranquil busyness that stoked our interest. 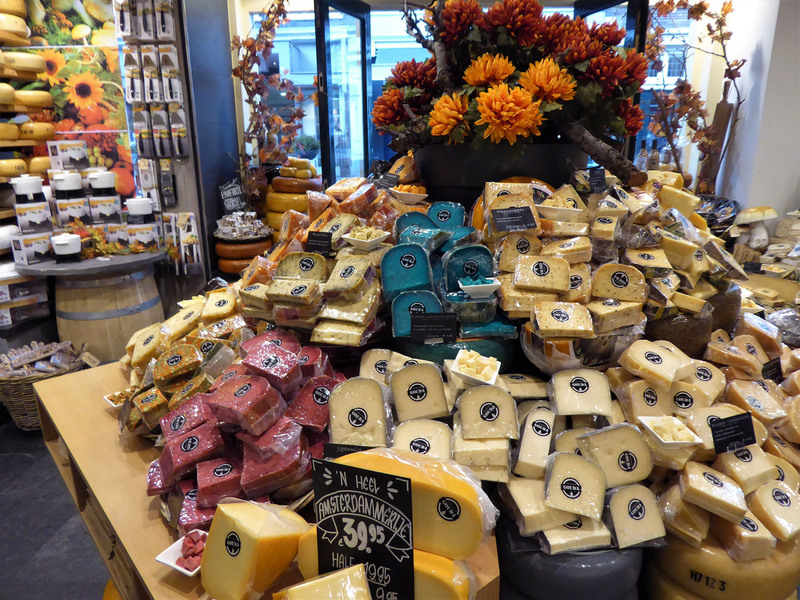 We stopped in to taste lots of cheeses in the specialist store we passed, with flavours from liquorice to smoke to chili to lavender to wasabi. 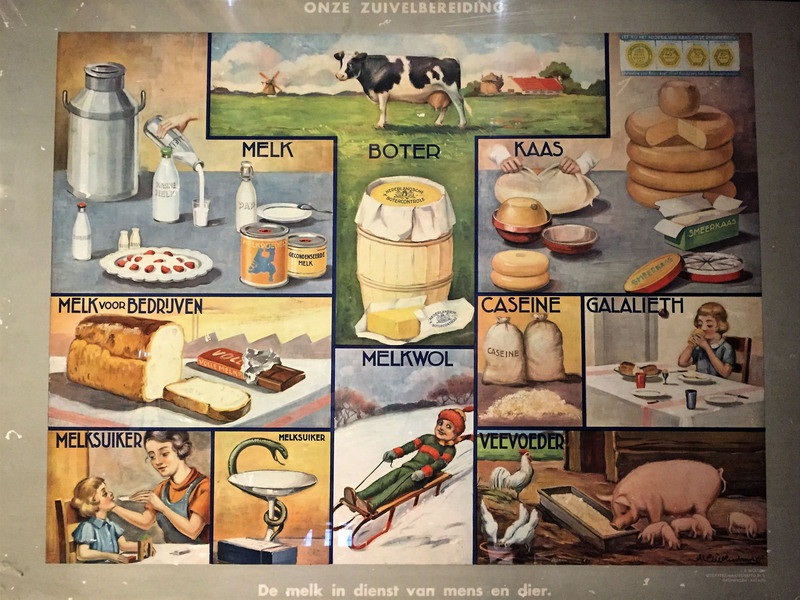 The brightly coloured cheese-blocks ranged from rainbow to solid black, from green to blue to red to white, depending on the flavours and spices added prior to the aging process. We decided very early that it was so pretty that we would spend a second night here, so we slowed up and took our time, looking into every small nook and cranny we passed on each lovely street. 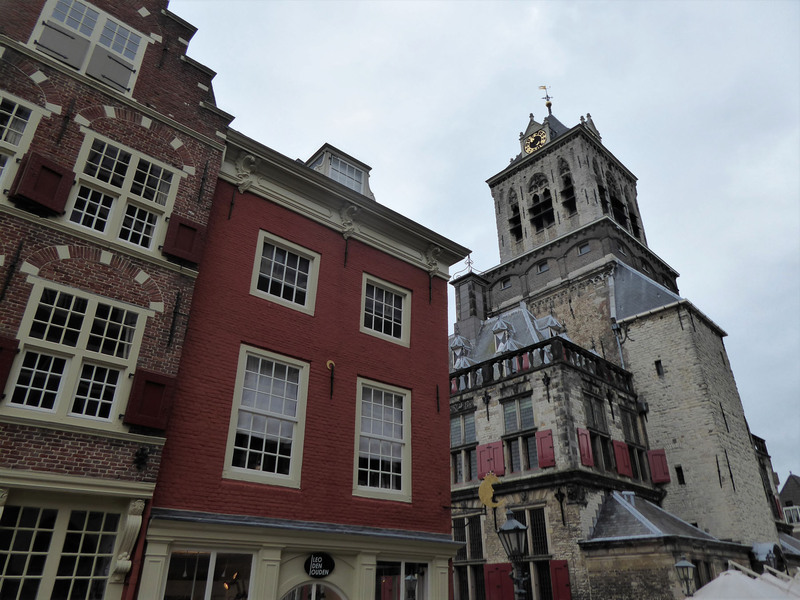 We circled the very large Sint Janskerk church, flanked by narrow canals and cobbled streets, before reaching the main square dominated by the gothic town hall, set alone in the centre. The square was really a wide triangle, coincidentally (or perhaps deliberately?) shaped like a giant wedge of cheese. 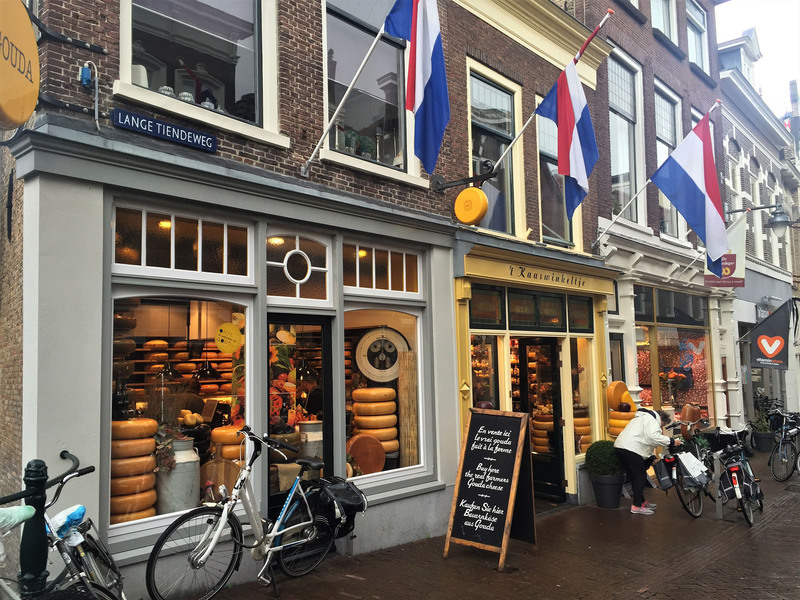 On Fridays during summer months it hosted a large cheese market with sellers and suppliers wearing traditional costumes, but on our visit it was almost empty of people. The edges were lined with the covered seating areas of restaurants and cafés, some with watching customers, but mostly quiet. 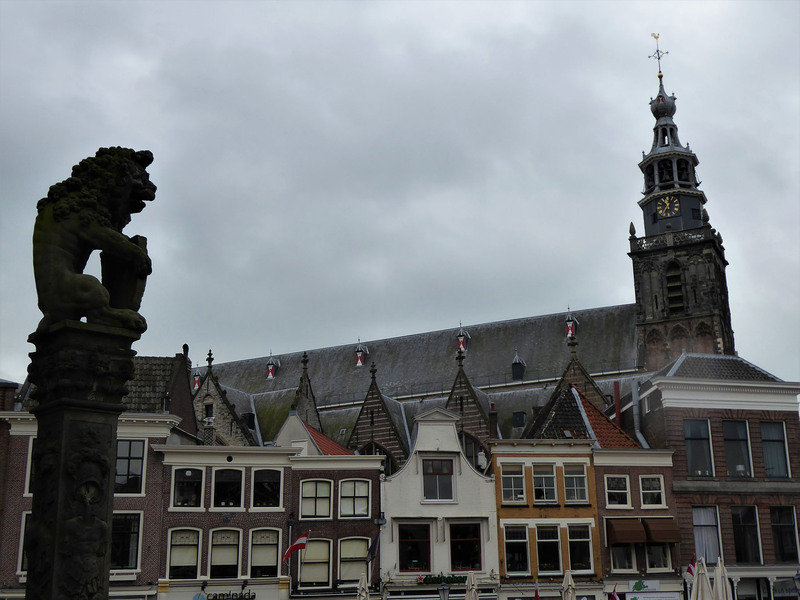 Red and white painted shutters lined the façade of the Town Hall and were repeated throughout the city on many buildings, including the tourist office that housed the Gouda Cheese Museum. The following day we did more of the same, simply wandering around quiet back streets. 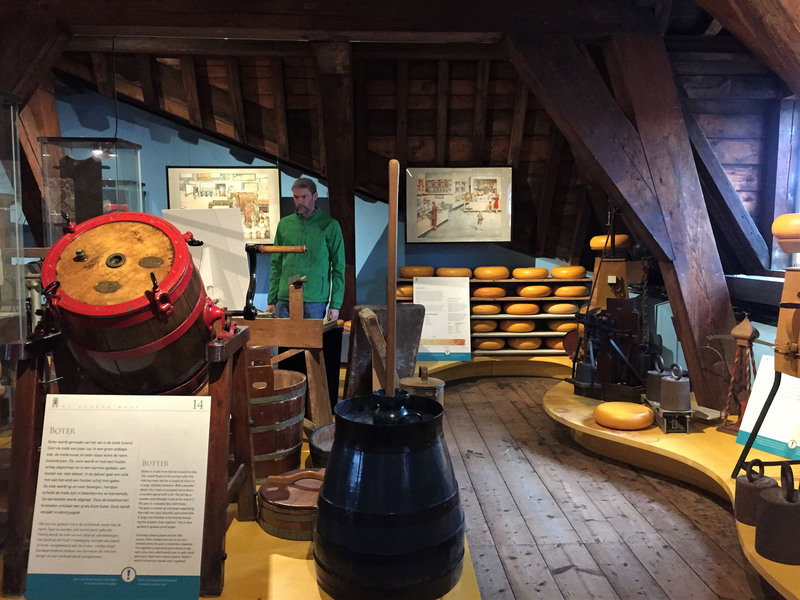 We visited the Gouda Cheese Museum where we watched a short video on how the local cheeses are produced, from cows in the field to shelves in the shops. We saw the equipment used over the years and how it brought prosperity to the region, and the political and commercial implications of when the crown, seeing the wealth of the suppliers grow, decided that cheese needed to have its own tax applied. We bought a few small items as gifts as we wandered, feeling glad to have had this one last, very lovely stop on our tour, as after the traffic mayhem of Germany we had thought our travels over and all we had left were the miles home. 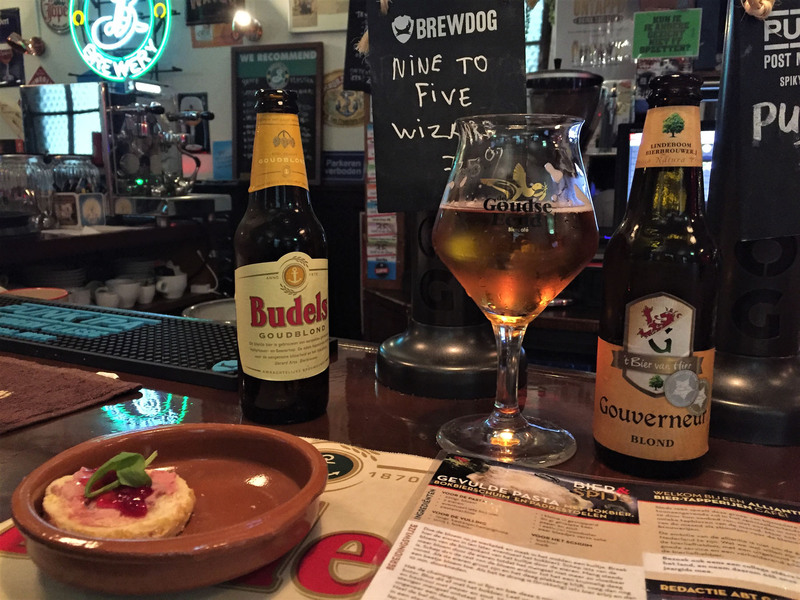 That night, our last abroad on this trip, we sought out a specialist craft beer bar we had read about, called Biercafé De Goudse Eend. 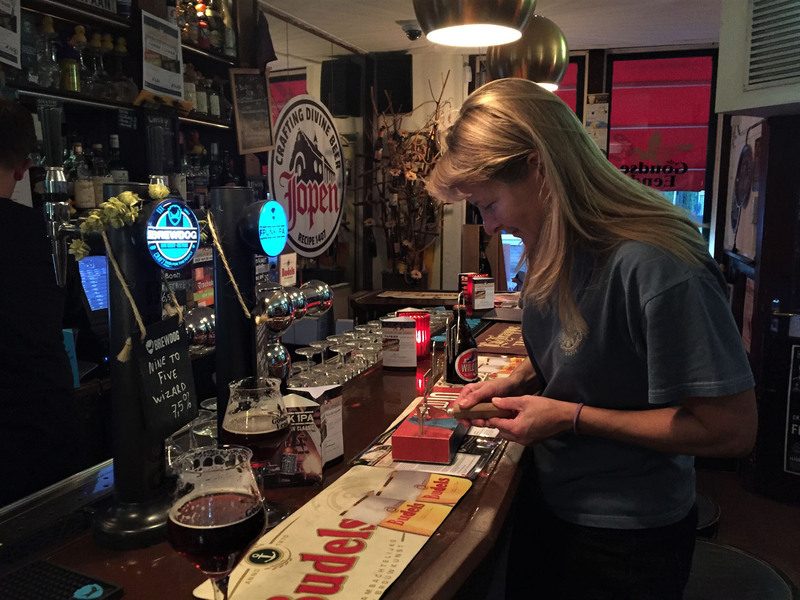 When we arrived we were the only customers except for one other, so we sat at the bar and chatted to the barman and owner Jeroen. 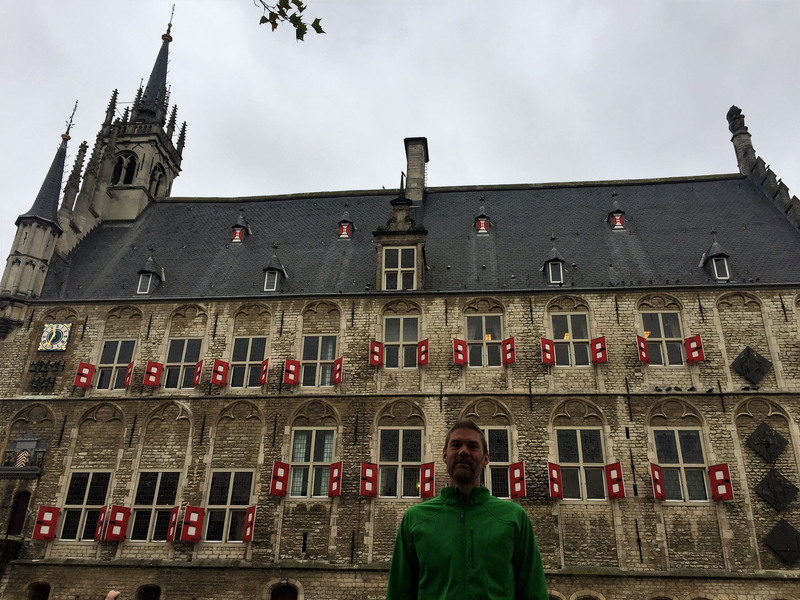 We tried a selection of beers and made many unsuccessful attempts to beat the challenge of moving a bottle opener over a metal strip shaped like the skyline of Antwerp without contact. We learned about the history of the bar, with its ever-growing collection of rubber ducks, and grew slowly sozzled with the bar and chilled atmosphere. The bar busied up very quickly later on, with many more beer aficionadas arriving to join the chat. 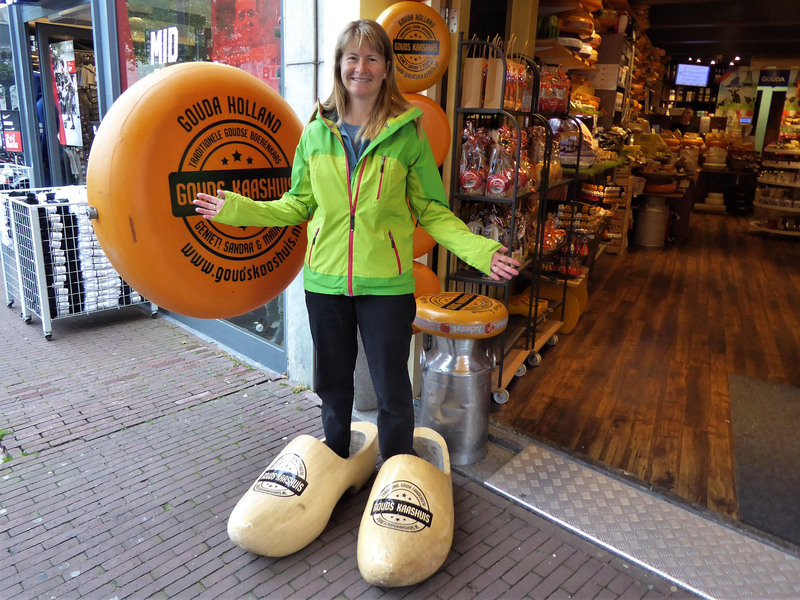 It was a great night to top off our travels and leave us with lasting memories of Gouda. The following morning we rose early, heads a little fuzzy, to pack up for the last time on this trip and head to the Hook of Holland. We were only an hour or so from the port, so we had plenty of time to spare before our afternoon crossing. 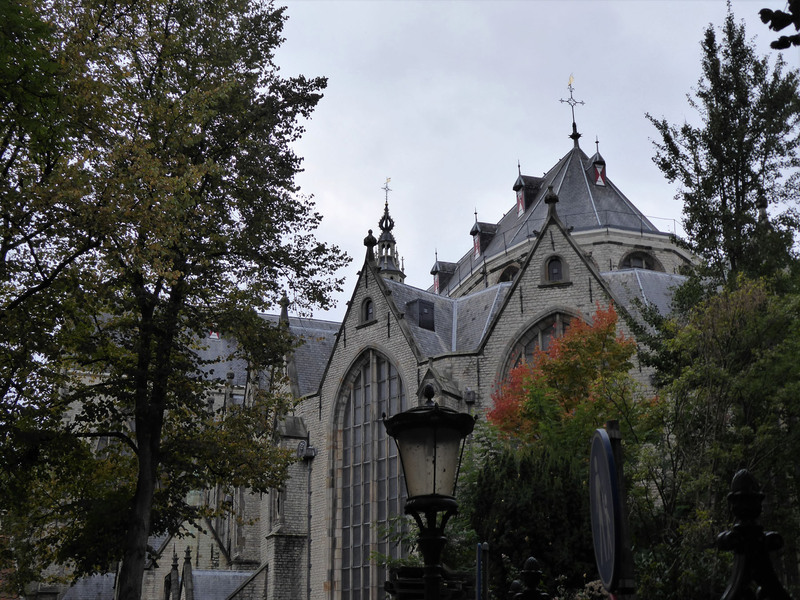 On the way we decided on one last flying visit, and called in to see Delft. Other than being synonymous with blue and white pottery, we knew very little about the town. After a struggle to park, and then with no means to pay for a ticket as neither cash or Visa cards were accepted, the parking attendants let us off if we promised to only be an hour. We would, so that was a bonus. 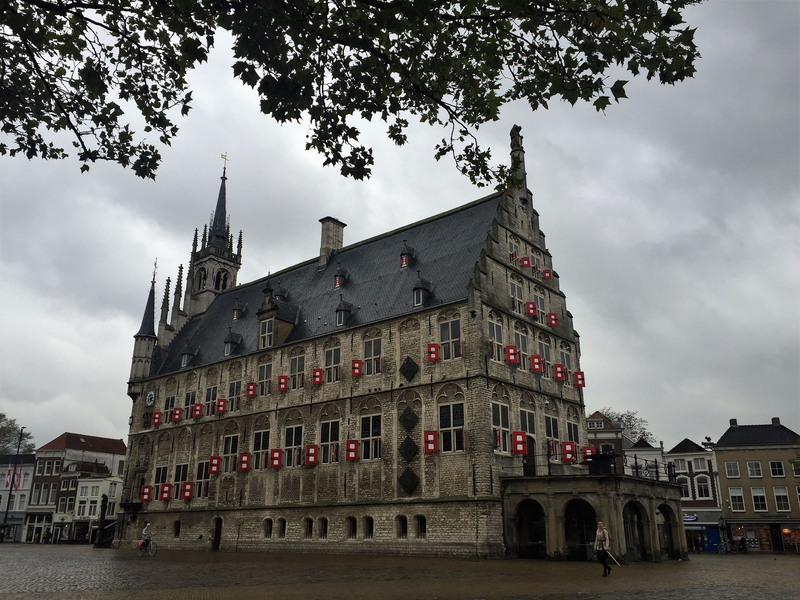 We walked along a canal into the main square, seeing several churches and the impressive town hall, amazed by the scale of the main square and the beauty of the surrounding streets. We had a rather boring and rocky six-hour ferry trip, arriving into Harwich port just after 8pm. After a winding queue through the port and customs areas, we broke free and drove around 10 miles to the nearby village of Little Bentley and parked up in the empty car park of the Bricklayers Arms. After confirming it was fine to stay, as they are a BritStops listed pub, we spent a lovely two hours drinking with Liz, the proprietor and owner. 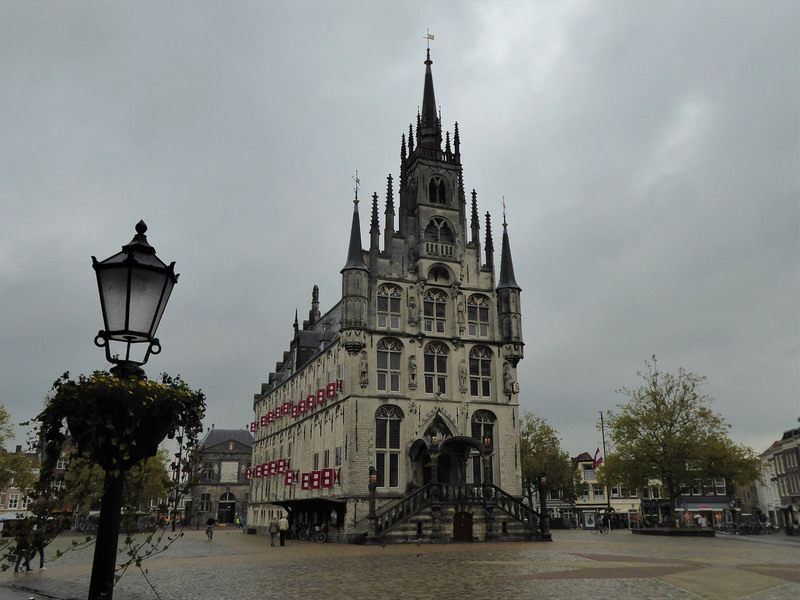 We were the only customers in the bar during our stay, and we couldn’t help but draw a comparison to the previous night’s bar in Gouda, so very different but so similar too. The following morning, excited to be back in the UK, we headed off to meet up with friends, our Scandinavia trip now at an end. It would be some time before we could process all we had seen over our incredible trip, almost six months of travel, with such a variation of experiences, scenery and activity. 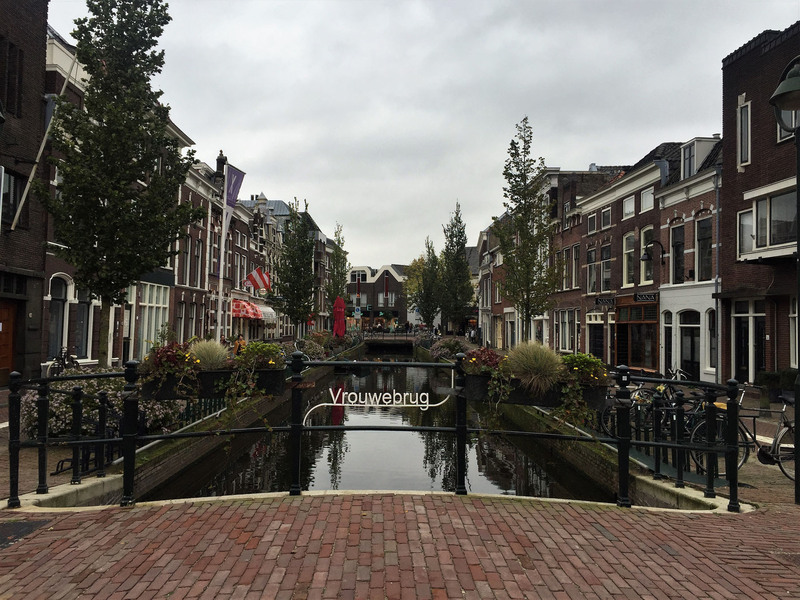 This entry was posted in 2017 Scandinavia Tour, In Netherlands, Netherlands, Our Travel Journal and tagged britstops, cheese, church, city break, craft beers, ferry, history, main square, museum, old town, pub visit, sightseeing, tourist, walking on Oct 17, 2017 by Aaron Hill.